These horned frogs are composed primarily of a mouth and a stomach. They are round and have mouths that seem to extend around their whole body. They do have legs, but they are usually only active when the frog is searching for its next meal. These horned frogs are fairly inactive amphibians. The majority of their time is spent sitting around waiting for prey to approach. They are usually very passive until it's time to eat, and then they become very aggressive towards larger animals, and even humans! Their purpose in life is to eat as much as possible! 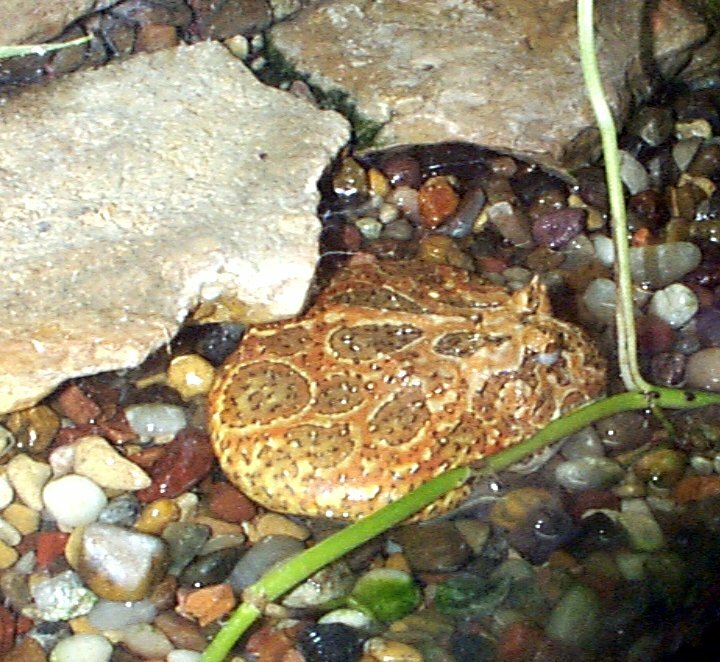 Most of these frogs prefer to live alone in leafy, wet environments. If a larger horned frog is placed in the presence of a smaller one, it is very likely that he will EAT the smaller frog.....so BEWARE! The normal life expectancy for these frogs is around 6 years. Some, however, can live anywhere from 12-13 years. Bell's horned frogs make very popular house pets and they are very easy to accomodate. One extraordinary characteristic that this amphibian possesses is its innate ability to devour organisms larger than its own body size! They feed on frogs, lizards and other reptiles. These horned frogs are responsible for controlling the population of small animals. Another fascinating trait is their ability to reproduce. The female frogs deposit up to 2000 eggs in standing water (jungle pools and small lagoons) and within 2 weeks, the eggs become froglets. During my visit at the Fort Worth Zoo, I had the opportunity to talk to a zookeeper who specialized in animals on display at the Herpetarium. This particular species of Bell's Horned Frog was most common in areas of Brazil, Uraguay and Paraguay. Most prefer to live in mossy, damp areas with shallow water in order to catch small prey. They are equipt with strong jaws and numerous sharp teeth. These frogs are very volatile and often times deliver a painful bite when disturbed. They feed primarily on mice, small lizards and other frogs, but in addition, they also enjoy 5 to 6 crickets a day. The zookeeper made it quite clear that these amphibians DO NOT do ANYTHING!! They are extremely inactive unless they are ready to eat or being attacked by a large predator. They are not social creatures, but they are very aware of what is going on around them. While visiting the Fort Worth Zoo, I was able to observe a single horned frog living in an isolated environment. He looked very similiar to the other frogs pictured on this webpage, but with slightly lighter skin. He was cream colored with peach and light green markings. He was living in a small glass aquarium and was surrounded with large, flat rocks and big leaves; a swampy-type atmosphere. There was a long piece of tree bark that ran around the inside of the aquarium that served as a means of exercise should the frog decide to move from his position. The frog was particularly lazy and did not move a muscle the entire time I was there observing. 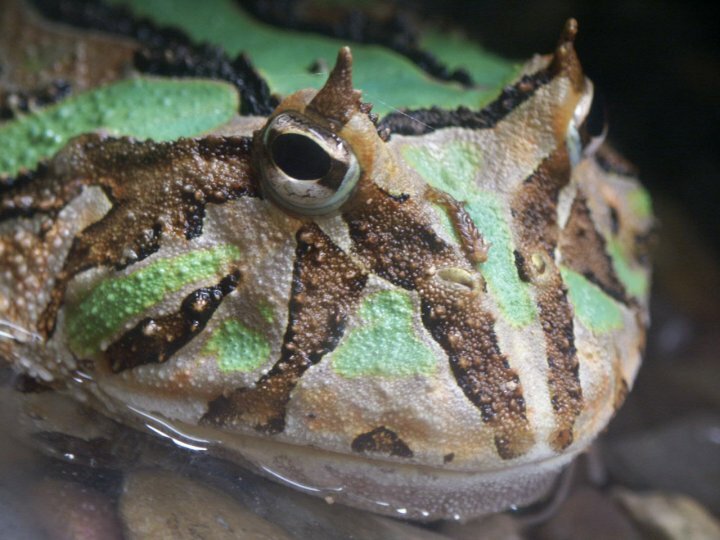 This species of horned frog was most commonly found in South America.